GISi's take on the GIS industry! The 24th Annual Virginia GIS Conference was held Tuesday, September 17th, 2013 in historic Williamsburg, Virginia. The event was sponsored by VAMLIS, the Virginia Association for Mapping and Land Information Systems, and was attended by around 250 GIS practitioners from across the state of Virginia. I had the pleasure of attending the conference, along with a few of my GISi colleagues: Anthony Scardino, Melinda Dubaj, John Martin, and Marvin Garland. The conference provided a great networking atmosphere to catch up with old colleagues and meet up and coming professionals, as the attendees ranged from college students to private sector to state and local government officials. Dan Widner, from the VGIN (Virginia Geographic Information Network) kicked off the morning with a keynote on the future of GIS within the commonwealth, and was followed by a round of lightning talks, among those, a great overview of the Virginia Broadband Initiative by Michael Edwards of VITA (Virginia Information Technologies Agency). Jackie Stephan of The City of Newport News discussed tracking energy usage within its offices. Mark Mandell of VDOT (Virginia Department Of Transportation) showed how they tracked snow plow progress via a mobile application and web mapping application during snow events. Andrew Becker displayed results from his Masters project on the predicting Amphibian Breeding Pools. Mike Sweeney from Esri gave a deep-dive into ArcGIS Online and the entire ArcGIS Platform. Chris Gerecke talked about improving user experience in application design. Lastly, David Wells, the president of VAMLIS awarded some door prizes provided by the conferences sponsors as well as, announced the winners of the map gallery at the college and professional level. A conference sponsor also hosted a short reception afterward that provided a great book-end to day’s events. 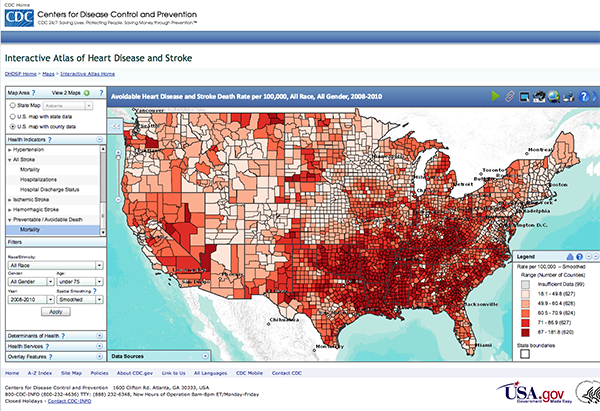 When we worked with the Center for Disease Control and Prevention (CDC), to build the Interactive Atlas of Heart Disease and Stroke, we knew it would serve as a great resource for anyone wanting geographic and demographic information related to heart disease and stroke. Their goal was to provide public health leadership to improve cardiovascular health for all. And the atlas would help identify places that bear the greatest burden of cardiovascular disease and potential causes, an early step towards tailoring resources and interventions to the needs of specific geographic areas. The project goals were to provide a new internal and public access interactive web mapping application for the display of heart disease and stroke data as well as their risk factors and related data. This involved an improved user interface experience and simplified data management. With over 20,000 hits since January from all 50 states and 100 countries, the project is a success. To recognize the CDC’s dedication and work to help prevent heart disease; Esri presented them with the 2013 SAG Award at their Annual User Conference in San Diego. Recently, researchers at the CDC published a report showing that out of 800,000 cardiovascular deaths each year, as many as 200,000 of the deaths could have been prevented if people had made health-related improvements to their lifestyle. But one thing the report noted was that the rates of preventable death from heart disease and stroke were highest in the South, indicating that longevity may have more to do with your ZIP code rather than your genetic code. With the highest rates of preventable death from heart disease and stroke concentrated in the South, it’s easy to visualize this finding within the Interactive Atlas application. The map below represents the report’s findings. The map allows users to select geographic areas to view, either by state, U.S. map with state data, or U.S. map with county data with the ability to pan and zoom to specific areas of the map. Various health Indicators can be selected if users want to view map data based on all heart disease, coronary heart disease, acute myocardial infarction, cardiac dysthymia, heart failure, hypertension, all stroke, ischemic stroke, hemorrhagic stroke, and preventable/avoidable death. Users can then filter by race/ethnicity, gender, age, year, and spatial smoothing. Other options can be selected to display on the map including determinants of health, for example social environment, race/ethnicity, and physical environment. If a user wanted to view available health services on the map like hospitals and pharmacies, they have that option. Users can also overlay the map to show healthcare facilities, roads and cities, and other boundaries. Another useful feature is the ability to view two maps side-by-side for the purpose of comparison. 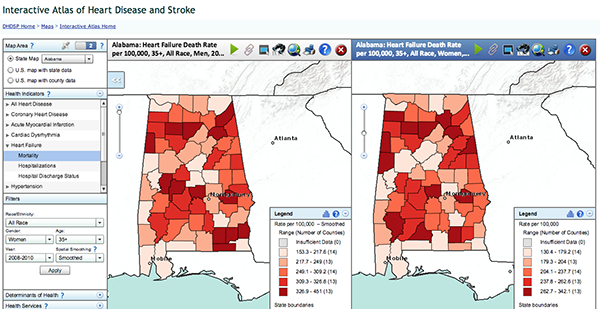 So if you wanted to visualize the heart failure death rate in Alabama for men versus women, you could easily switch it to view one map showing data for men and another map showing data for women. And if that isn’t enough of a cool feature, the map has the ability to animate so that users can view historical data over time. This is achieved by clicking the play icon on the map toolbar, shown in the screenshot below. What’s intriguing about the interactive map, is not only what it shows, but the technology behind it. 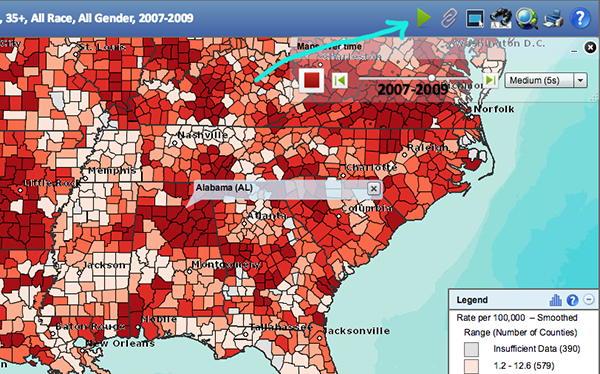 The CDC atlas is a Flex application that consumes map services from ArcGIS Server 10. The data is housed within SQL Server. The application also consists of a web service (WCF) that provides health and demographic data, which is dynamically bound to spatial boundaries on the client. The Flex app loads the county and state boundaries during startup and retrieves health and demographical data from the web service, as needed per the criteria chosen by the user. The app also uses a custom configuration schema that allows for easy updating and maintenance of the data by CDC. It is exciting to see this application put to great use and really providing that spatial insight that makes it a little easier to understand the new reports the CDC released to the public. And since we’ve spent enough time playing around with the application and zooming in and out of areas on the map, namely our hometowns, we’re thinking it’s time to start making some health improvements. Maybe company meetings on the b-ball court? Could be a start! Being the sole designer in a company our size can be a daunting task. With 100’s projects, I’m not always able to jump in and help when there are interface woes. I’ve been wondering for the past several months how I can make a bigger impact without going through the awkward process of cloning myself. After our company meeting, Unplugged, it came to me. I needed to take the approach of working smarter rather than harder. In this instance, it means I need to share more of my knowledge, rather than piling on more projects. So this post marks the beginning of my knowledge transfer to developers who want to enhance their interface design skills. Typically, this is called “Know Thy User”, but I’ve changed it to people. I believe using the generic term user removes emotions from the equation, which is wrong. People use our applications and people are emotional creatures. It’s in our best interest not to forget this crucial point. You need to get an understanding of the people who will be using your application by any means possible. Conduct interviews. 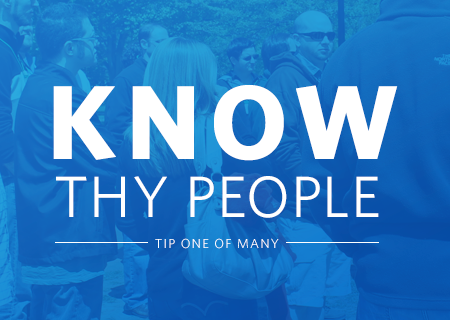 If you can’t talk to people in-person or via phone, talk to someone who can give some insight. Some information, even secondhand, is useful. Gather whatever data you can find. Be it Google Analytics reports, 3rd party resources, or internal analytic reports. Perform user tests. If a system already exists, gather some users and run them through some of the core tasks the application does. This can be done in-person or remotely. There are several tools out there that can help you out with recording sessions remotely and locally so you can share with a broader group. If it’s a new application, get wireframes in front of the users, so you can get feedback as soon as possible. The sooner you catch issues, the easier and cheaper they are to change. Don’t worry about things being polished. People like to be involved in the process and see their feedback acted upon. After all of this curating, you should have a better understanding of how your people differ, what their goals are, what their needs are, how they think, and how they feel. You will begin to see trends/similarities between them, which will provide you with natural groupings. By having these groups to design for, this allows you to focus on the important features that meet the needs of the group instead of random individuals. This makes your job easier. You maybe be uncomfortable with conducting interviews/talking with strangers and tempted to skip this part, please don’t. You will end up creating something that you “think” is what they want, but the flaw there is it’s your thoughts not the people who will be using the application. So boldly go where you haven’t before and get out there and talk to people! All too often, we come out running but we often forget to acknowledge that we just focused on the final product. That map you came upon was not just a few hours of work to make it look great on some glossy paper. That application was not just a few developers and designers making a great interface for the public. It represents weeks, months, or even years of building great data that analysts and developers expose through their products. Don’t get me wrong, the talents witnessed at these events are amazing; and we need great maps and apps to share our data. However, if the data is no good, who will want to use our maps and apps? What value can our products have then? As you develop your next project, spend some time thinking about the data. Plan to foster an environment where data management is key to the strategy. How will it be stored? How will it be maintained? How will you ensure its quality? These are just a few thoughts to get started thinking about data management strategy and how it can make your product relevant. All projects start here; and while defining a database design is rarely left out, it is important to get this step right in the beginning. What data model should be used; is the existing model good enough or should a new industry model be implemented? This answer may vary depending on your organization and project needs. It is importance to understand the end goal, which will help define the requirements and drive the database design. Designing your database correctly early on will ensure all relevant data has a place in the model. There is nothing worse than having to review every record over again because you had to add one more attribute. Many projects use the most current data or collect new data once during the project scope. This might suffice for the initial deliverable; but the data becomes stale the day it is published. From that day forward, the value of the product begins to decrease. How can you keep your product relevant? Build data maintenance into the existing business processes. The staff from the group you built the product for often completes these processes. Be sure to include this group as a key stakeholder in your project. Get their buy-in and discuss altering their business processes to include a GIS data maintenance step. If you help them realize the value of your product, this will be a welcome addition to their processes. Designing a great data model and keeping your database current is great. These are big steps in making your data relevant. If it meets their needs, people will want to use your product and rely on it for answers. What happens when they find errors in the data? Errors are going to happen; there is no way around it because we all make mistakes. How you handle the errors will define your data’s relevance and possibly even make it the authoritative source. Plan for regular quality control checks to ensure it meets a defined standard. These should include both automated checks for schema discrepancies and hands-on checks to verify content quality. You may also include a method for users to submit errors they have found. Implementing data quality will help establish your dataset as a trusted source. So if your data is incomplete, outdated or full of errors your product will not be relevant no matter how great the idea was. Remember, when people use your product it is the data and the story you can tell with it that they are truly interested in. Make data a priority and stay relevant. BIRMINGHAM, Alabama – August 9, 2013 – GISi, an Esri Platinum Partner, recently earned the new ArcGIS Online Specialty designation from Esri. 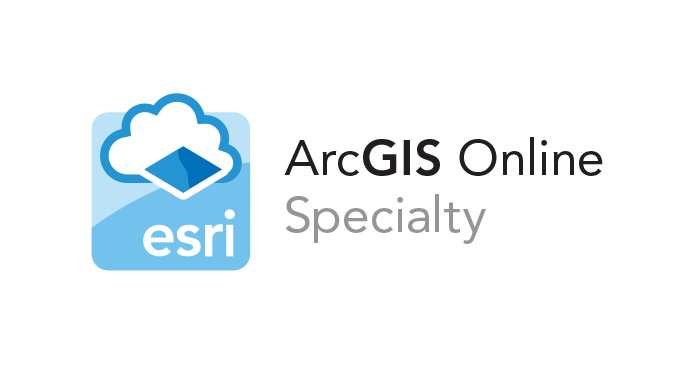 This designation is provided to Esri partners who demonstrate the ability to sell, implement, and develop solutions and services for ArcGIS Online. ArcGIS is the GIS industry’s leading software platform for developing and managing geospatial information and solutions. It enables users to perform deep spatial analysis and better understand their data and assets, leading to improved business decisions. GISi has a track record of client success with ArcGIS Online in multiple markets. In addition to helping many clients implement ArcGIS Online, they have developed several applications that can be accessed through the ArcGIS Online Maps and Apps Gallery. GISi is an award-winning GIS professional services firm located in Birmingham, Ala., with offices throughout the United States. GISi has a passion for delivering customer driven location technology solutions to federal, state and local governments, and commercial organizations. This is the first installment of a short series of blog posts written to help you build a world-class location enabled supply chain. Building a world-class supply chain is not easy but there are five keys to help you get there: (1) Optimization, (2) Velocity, (3) Adaptability, (4) Synchronization, and (5) Profitability. These are key attributes that proper use of location based technology and information systems can drive bring to the fight to achieve a world-class supply chain. We’ll begin with optimization. Using the location information you already have in your business systems to optimize your supply chain is the first of our keys to achieving a world-class supply chain. Some of the largest costs in your supply chain are shipping costs. Sounds obvious, fuel cost are high and few forecasters are expecting those costs to decrease appreciably in the near future. These shipping costs can be overt and easy to identify, what you are paying to the delivery service or to maintain your fleet of trucks. They can be more covert, embedded in higher unit costs from suppliers. Costs of having more goods in transit to you because they are traveling great distances are two examples. Mastering the “where” lets you take charge. Using the power of location analytics, you can optimize your supply chain by understanding where your customer or distributors are and where the suppliers are for the materials you need. You can optimize your supply chain, just by picking the right place to build a plant or make the right decision on which is the best of your existing facilities to assemble your product in because of its location. By understanding where your materials are, while they are in route to you lets you manage risk by helping your avert storms, backups or even civil unrest around the globe. Having clear visibility is no longer a nice to have, it is essential. For several decades now we have been driving Lean practices. Gone are the days of expensive inventories sitting in large warehouses next to our plants. We are driving electronic Kanbans and supplier held inventory to arrive within very narrow windows to achieve Takt times. Understanding the total volume of goods in your supply chain helps you manage costs with greater depth of understanding. Optimizing where your suppliers are is critical. Enabling buyers to visualize where the suppliers are for the commodities they control is a key to driving a world class supply chain. Unit price, and advantageous Terms and conditions are important, but being able to step back and see that perhaps an extra penny or two in unit price can be far offset by hundreds of dollars saved in shipping cost due to 300-400 miles of shorter transportation or the amount of risk to on time delivery there is because we able to identify those vendors that were closest to our needs. Enabling the purchasing aspects of your supply chain with location information products at the very front end will help better control you your bottom line. Using the location information and some very basic location analytic tools to optimize your supply chain you can make some real gains in reducing supply chain cost, increasing velocity, and reducing supply chain risk. All of these combined benefits of actively using the location information within your enterprise will drive you forward to a world-class location enabled supply chain. Last week while attending the Esri User Conference in San Diego we announced the winners of our GIS-Ink.Com campaign. Excited to announce that @sonicwishes and @TheresaQuill are the winners of our #GISInk campaign! Thank you to all who voted and submitted! Theresa and Angela both worked hard in lobbying for your votes and we are very excited that they won! Each has been sent a GoPro Hero 3 Black Edition camera. Theresa won the Geographic Ink competition with the art to our left. As part of her winning, she shared a bit more about what the Ink means to her. Angela won the Industry Ink competition with the art to our right. As a part of her winning, she shared with us the road she traveled to get her ink. I didn’t get a tattoo until I turned 27. I actually got is as a birthday gift from one of most closest friends. I had been tossing around the idea of getting a cherry blossom tree, but I hadn’t given it the proper thought. 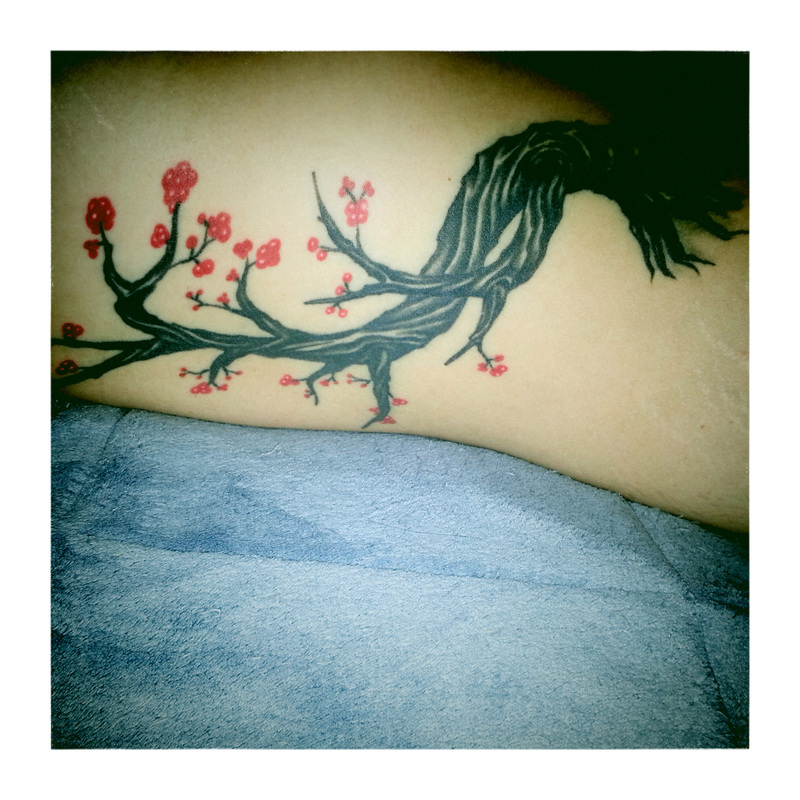 The, when I got a 3 day notice that I had a tattoo session payed for on the day of my birthday, and I need to make up my mind ASAP, I decided that since the idea of the cherry blossom had been with me for more than 4 years, it might as well be ink on my skin for a lifetime. I have never given it any special meaning. Not to this one, not to the others. And now that I am being asked about the meaning behind my ink, I can only think: nature. It is what prevails in every single one of my tattoos. And being a Geographer, a nature lover, an explorer, I cannot help but relate something so permanent for me to the marvelous forms of nature. 3 years ago and I love it more every day. I truly believe this will always be my favorite one, no matter which ones I get afterwards. Congratulations to both winners and remember to represent your ‘Ink’ each day!